Visit the BEST of Napa in a day, from big name wineries to local's favorite restaurants, all planned out for you stop by stop, perfect for first timers! 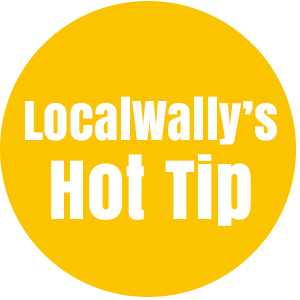 Local Wally's Napa Tourist Guide is the #1 trusted source for unbiased info on Napa. First time visitors to Napa Valley often feel overwhelmed planning a trip to wine country. With hundreds of wineries and dozens of world class restaurants, which ones do you choose to squeeze into a weekend trip? Trust that guy at work to help guide you? You don't even trust him with your stapler! Instead, let me show you the best Napa wineries to visit, the best places to eat, and the best winery tours. Forget about doing tons of research, instead use my Napa 101 cheat sheet, a stop by stop agenda that takes you to all of the highlights, perfect for first timers who want to see the big name and iconic wineries that helped make Napa famous. Day One sticks mainly to Highway 29, the main road, and Day Two (Napa 102) explores the Silverado Trail. Get a FREE promo code for $10 off at Sterling from me! Email me for the code. Sterling 2 for 1? Beringer, Grigich, BV, Rutherford Ranch??? Don’t be the only one paying full price for wine tasting! Get 2 for 1’s at some of Napa and Sonoma’s top wineries, including the Sterling Vineyard tram ride. Save $25 or more at every stop with the wine pass. Get one per couple, the pass is only $39.99 so as long as you visit more than one winery you will absolutely come out ahead. Here are all the deals and when you are ready to buy use this button below to get my discounted price. Where is the Best Place to Stay in Napa Valley? With a few notable exceptions the best places to start your search for hotels and resorts in Napa Valley are Downtown Napa and Yountviille. Both are walking distance to restaurants, something you will be thankful for at the end of the day. Downtown is typically a bit less expensive and has a bit more night life. Yountville is a quaint little town surrounded by some of Napa's best restaurants and and both have nearby tasting rooms. Up mid-valley is The Harvest Inn, a top pick (email me as I sometimes have discounts there for free) and along the Silverado Trail are two incredible resorts, Auberge du Soleil and Meadowood. In Calistoga is Solage, another top end and high end resort worth checking out. There are also AirBnB's around Napa. Check out my friend Jamie's place in Downtown Napa. With a private entrance, private bath, 3 full rooms to yourself and priced lower than a hotel it's a good pick for those who are looking for a great place to crash without breaking the bank. When is the Best Time to Visit Napa Valley? Every season is different and has its own pro's and con's. Spring is when all the fields turn to gold with mustard plants, tourists are usually sparse, it's my favorite time of the year. The negatives? No grapes on the vines, no smell of fermenting fruit in the air. Once June hits the Summer crowds stampede Napa. It's hot, it's lively, but come in Summer and you'll want to avoid the big touristy wineries and hit the smaller boutiques to get away from the crowds. In Fall is crush, the time of year when grapes are harvested and, well, crushed. There's no telling when the grapes will be picked but you can count on monster crowds from September through October. If you come at this time make sure you do a production tour to see how wine is made and don't forget to do a grape stomp like they did in I Love Lucy. From November through February it's often raining and the crowds are thin. Nothing wrong with wine tasting on a rainy day for romantics. Where Can I get Free Wine Tasting in Napa Valley? Napa wine tasting is expensive. The days of cruising up and down the main drag and stopping in at any winery and getting free wine for the asking are long gone. There are websites claiming to have free tastings at Chandon or Castillo di Amorosa (and many other popular wineries) but most if not all of these are fakes, click bait to get google to rank them high. But don’t give up! If you are coming to Napa before the end of May, 2019, there are at least a dozen wineries who offer FREE tastings to my readers who have a Priority Wine Pass. The pass is $39.99 but you’ll taste for free at Charles Krug, Sterling Vineyards and the tram ride, among others. Sure it’s not quite free but you can taste all weekend for $39.99 and never take out your credit card. 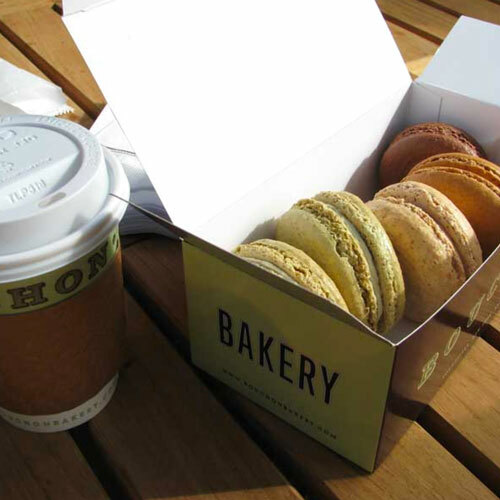 Set that alarm clock to get you to Yountville bright and early and head straight to Bouchon Bakery where you'll find a great coffee bar and delightful pastries. Bouchon, of course, is owned by Thomas Keller, the chef behind The French Laundry. Dinner there will set you back $310 per person but at Bouchon Bakery an authentic French macaroon is but a few dollars, a delicious taste of the Keller magic. A table in the morning sun with a bag of pastries, cup of coffee, a perfect start to your day. Take a short 5 minute walk north to The French Laundry where you can take your photo in front of the sign. Imagine how impressed your friends will be when they get your next Christmas card. 2019 Update: Many wineries below are now FREE with the Priority Wine Pass. If you want to plan out a weekend that focuses just one the FREE tastings then click here to read my latest blog. 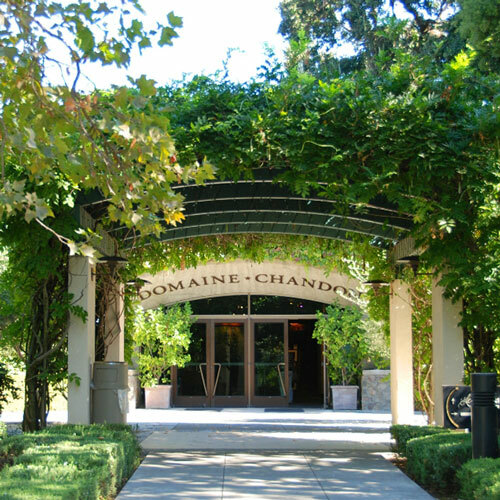 Right up the street from Yountville is Domaine Chandon, a beautiful winery with sparkling wines. Get there right when they open at 10AM to order a flight of champagne. While the outside terrace is tempting I suggest you stick to the bar where you can chat with the server to start your wine education. If you're serious about remembering what you like when you get home you might want to bring a notepad to take some notes. Trust me, you will not remember anything by the end of the day! If you are coming with a large group of 10 or more note that Domaine Chandon is one of the few wineries that will welcome your group - as long as you make reservations. This place gets busy so come early. I'm not a huge fan of stopping at a restaurant for lunch unless you're staying for a few days. Why? Because restaurants take time, precious time when you could be wine tasting. I like to just grab a good loaf of bread, some cheese, some meats, and dine a la car when driving to the next stop. And look, there's Oakville Grocery on your way to your next stop! Slam those brakes and grab some grub for later. Well meaning friends are going to tell you to skip Mondavi, calling it commercial or touristy, but that's crazy talk. Step through the famous archway and you'll be enveloped in Napa history, Mondavi being one of the first wineries to offer tours and tastings. And that's exactly what you should do, tour and taste at Napa's best basic wine tour. The basic walking tour happens on the hour and requires no reservations but you should upgrade to the reserve tour where you'll go from vines to wines in 90 minutes. This tour requires reservations which means you'll be away from the sometimes huge crowds of walk-in first timers trying to push their way to the front of the bar. Make reservations for the tour. If you've seen the movie Bottle Shock or have read up on the 1976 Judgement of Paris wine tastings, the event that put Napa on the map by beating out the French, then you might have heard of a wine maker named Mike Grgich. He was the one who made the winning chardonnay as the wine maker at Chateau Montelena. He soon thereafter opened his own winery which has been synonymous with the best wines in Napa. Unlike many of the newer tasting rooms which are huge and modern, Grgich's tasting room is a complete throwback to the 70's. I like that and I think you will too. Come in with the Priority Wine Pass and get two for one tastings, saving you $25. One of Napa's original wineries, Beringer Vineyards offers lush landscaping and historic architecture along with a variety of tasting experiences. Those wanting to experience everything Napa has to offer should opt for the Legendary Cave Tour, a 30 minute walk through the tunnels and Old Winery while sampling 3 of their wines. More serious wine lovers will enjoy the reserve tastings in the Rhine House, the beautiful historic home where the Beringer brothers lived. Reservations required. Though the tours are not discounted you CAN get two for one tastings in the Old Winery with your Priority Wine Pass saving you $25. Calling AXR a "new" winery is a bit misleading. It's a historic winery that recently reopened with a fresh start. AXR is surrounded by redwood trees, a fairy circle (you'll see), cottages, and a historic barn and beautiful tasting room. The scenery alone will blow you away - well, until you taste their wines and then hold on to your head and glass because it will blow your mind how good it is! Don't think twice, do this one. There are a lot of super popular and busy wineries - this is not one of them but it will be someday. Come and experience it with no crowds. Get 2 Free Tastings with 2 Bottle Purchase, save $100. hey wally, what about the sterling tram and the napa castle? No doubt about it, the tram ride at Sterling Vineyards and Castello di Amorosa, the Napa Castle, are two of the most popular tourist attractions in the valley. During peak season if these two are on your bucket list then plan your day to hit these first. Crowds can be as thick as Disneyland and while both stops are impressive they're not essential if it means waiting in long lines just to get in. Don't waste your time looking for a deal at the castle - the only one out there other than the standard "buy a case, get tasting fee waived" is with me - $25 off per person for the Napa Wine Train and Castle Excursion. As for Sterling, email me and I'll send you out a free coupon. 5:00: Want to do One More? Let's make it Two! Most wineries close by 430 or 5 and stop taking visitors at least 15 minutes before closing. But don't worry, if you want to cap off a fun day of wine tasting with, well, more wine tasting then head to Yountville where you'll find a handful of great tasting rooms all within walking distance. 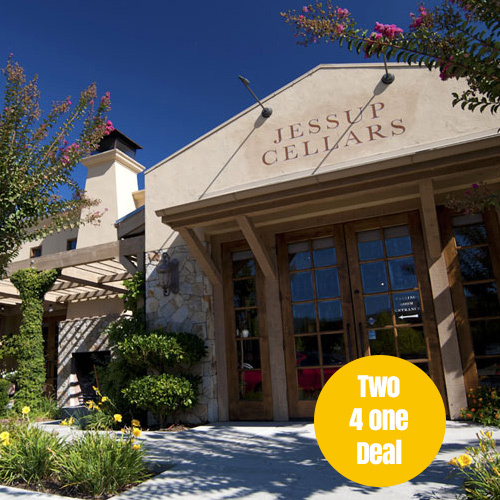 My favorite is Jessup Cellars (half art gallery, half wine tasting room, 2 for 1 with Wine Pass, save $25), open until at least 6 PM and later in Summer and high season. Across the street is another good one, Ma(i)sonry, an eclectic store with wine tasting, and now that you're full of wine let's not drive but rather walk to dinner. And guess what, Yountville has tons of great restaurants you can walk to. Yountville is filled with top notch restaurants, from ultra expensive like The French Laundry to one of my favorite moderately priced restaurants, Redd Wood. If you're on a budget but have a foodie mindset then you can do no better. Ciccio is another favorite with locals and right across the street from Jessup Cellars. Down the road a bit are the classics - Bistro Jeanty, Bouchon, Michael Chiarello's Bottega, Ad Hoc, all delicious. Rutherford Grill: No corkage fee so bring in one of your bottles you bought today and order a grilled artichoke with a rack of ribs. Lively, fun, with an intoxicating smokey aroma that will long linger in your memory. Top pick! Farmstead: Fancier than the rest but still pretty casual in a farmhouse sort of way, Farmstead at Long Meadow Ranch has some seriously good food in a lively setting. For more dining ideas to go my complete dining guide. do the math - really, i'm pretty lazy so you do it! Not every winery on this agenda takes the Priority Wine Pass but enough do to make it worth your while. The Priority Wine Pass is $39.99 and you only need one per couple. Do this agenda without it and you'll spend $350 on tasting fees! Did you fall off your chair? Now get the pass and pay $225. Even backing out the cost of the pass you are, hmmm, $85 ahead? It's not my company, I don't get winery kickbacks, I just like it for its good deals for my readers. Buy it here and get 1 per couple. Want to See All of the Deals on the Priority Wine Pass? Go here for the most up to date deal listings. I have a lot of fond memories of going to A/O when they were nobodies and serving wine out of a trailer. Today it's hugely popular and a seat next to the glorious water fountain a prime spot. And yes, their wines are high end deliciousness. Dog friendly, no reservations needed unless you're coming on a Saturday after 2 PM, open until 6, standard tastings are $50 per person and no deals that I know of. Picnics allowed only for wine club members and require reservations. Good for: Lounging in the afternoon in front of the fountain. I have a well intended friend who always gets my hopes up by saying "I got you a bottle of Cakebread!" and then pulls out Cupcake wine. Oh shoot, I just have to smile and pretend I'm drinking the good stuff when this happens. He has no idea how good Cakebread wines are and their reservations only tour and tastings are a well priced $35. You walk the winery and grounds and taste in small groups - and they actually pour Cakebread wine, not Cupcake! Good for: Those looking for a bit of VIP treatment away from the bar tasting crowds. The Napa "castle" is on everyone's short list. It's a full scale castle complete with all the fixings. But it's also busier than Disneyland so if you must go then go early in the morning, as soon as they open. The standard tasting gets you a peek into the castle so opt for the tour where you'll see the entire castle, including the torture chamber. There are no deals no matter what you see on the internet other than a lame "buy a case and get a standard tasting waived" offer, pretty much standard. No lookie loo freebies, $30 to taste, $45 and up to tour, everyone pays - even kiddos. Good for: Families dragging bored teenagers along, big group friendly. Believe it or not, Inglenook used to be a premium wine. But greed took over and turned it into a jug wine. Later Francis Ford Coppola, rolling in dough after the Godfather movies, rescued and resurrected it and turned it around. The winery itself is the draw with beautiful historic buildings, a bistro where you can kick back with a bottle of wine and some snacks, a large fountain where kids can sail model boats, and a setting that will make you want to stay all day. Military and locals get Two for One tastings, everyone pays $45 per person. Good For: Long afternoons with nothing to do, it's a beautiful setting. A fun tasting experience, especially if Alan Arnopole is around to yodel and rap about, what else, wine. You have to see it to believe it - check it out on this YouTube. No reservations required for groups of 7 or less means huge crowds but Peju queues you up into small groups so when it's your time you don't have to fight for a space at the bar. Once in expect the tastings to flow rather quickly, 20 minutes and you are out of there. $35 per person. Good for: Fun wine tasting entertainment, a good stop if it's not busy. You like bubbles? I mean, really like bubbles? Then do the Schramsberg tour, a unique experience that takes you into their hand carved caves and their history as one of the pioneers in Napa. They'll show you how they still make their sparkling wines the old ways and then you taste inside the caves lit by candles. Quite the experience, $70 per person. Good for: Romantics and sparkling wine lovers. Email me to get a Discount Coupon! But before you go to Sterling let me tell it to you straight. As a winery experience I'm a bit torn - the tram is fun, the views great, and it's group friendly, up to 9 people. But the tasting experience is a bit like going to a restaurant and being served by a wait staff that memorized the daily specials. That said, if you have bored kids screaming at you to take them somewhere fun, or if you just want to do something different, then Sterling is a good pick - make sure you email me for the free coupon! FREE $10 OFF PER PERSON DEAL - EMAIL ME! Good for: Families with kids, first timers looking for a bit of an adventure. You're Not Done Yet! More Updated Napa Info!